No, not trick photography, it really is this big! 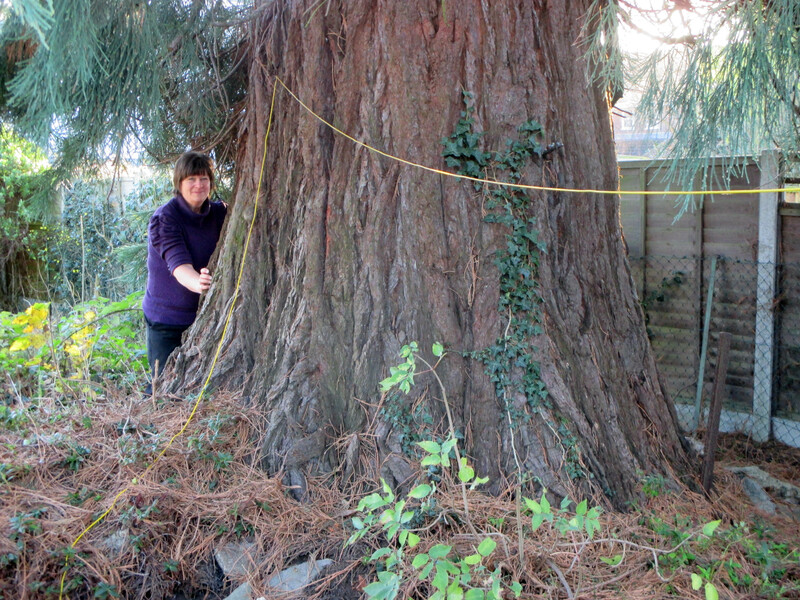 Thundersley's biggest Christmas tree - ever! 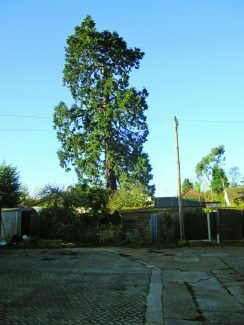 The specimen “Wellingtonia” tree (also commonly known as a Giant Sequoia), situated in a back garden in Hadleigh Park Avenue, is the most visible and tangible natural link to our Borough’s glorious past, when a Baronet lived in Hadleigh’s fine regency Great House overlooking the Common at the crossroads where the parishes of Hadleigh, Thundersley and Benfleet converge. 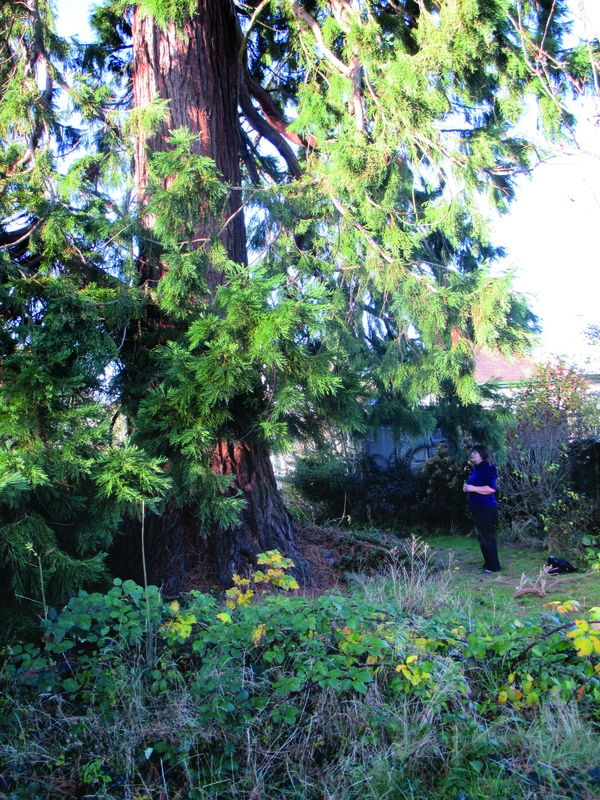 The tree was once considerably taller – it was struck by lightning in the 80s – yet it continues in very good health. I estimate its planting date to be before or around 1860. It is registered with The Woodland Trust as a “Remarkable Tree” on their website and also features on the excellent Redwood World website. I personally have not seen a more impressive specimen in the eastern counties (though there are scarce few). It can be seen quite clearly from near the Virgin Gym in Rayleigh Road, over half a mile away. Its height has not yet been ascertained but it measures over 17ft circumference at “head height” (and considerably more at its base). 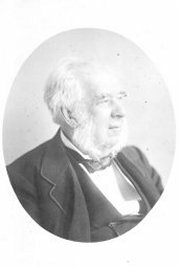 William Lobb, pioneering plant collector, brought seed to England in December 1853 from the Sierra Nevada, California. The species was christened “Wellingtonia” by the marketing gurus at the Veitch Nurseries in Chelsea (the sole distributor) in celebration of the Iron Duke whose state funeral had recently been the focus of the world’s media. With unerring predictability, rich Victorians clamoured to be among the first to sport in their estate gardens a specimen of the “greatest tree in the world”. Queen Victoria and Prince Albert were early recipients of one tree each, which they planted at Osborne House (I.O.W.). 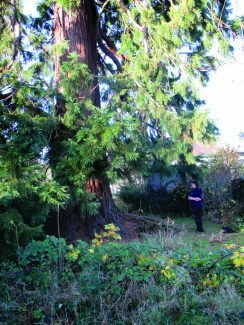 We can surmise that a Wellingtonia was ordered around the same time and planted in the pleasure garden of the 18-acre Hadleigh House estate. By the time Sir Charles Nicholson (at the age of 55) took up residence at Hadleigh House in 1864, the tree was, in all likelihood, well established. 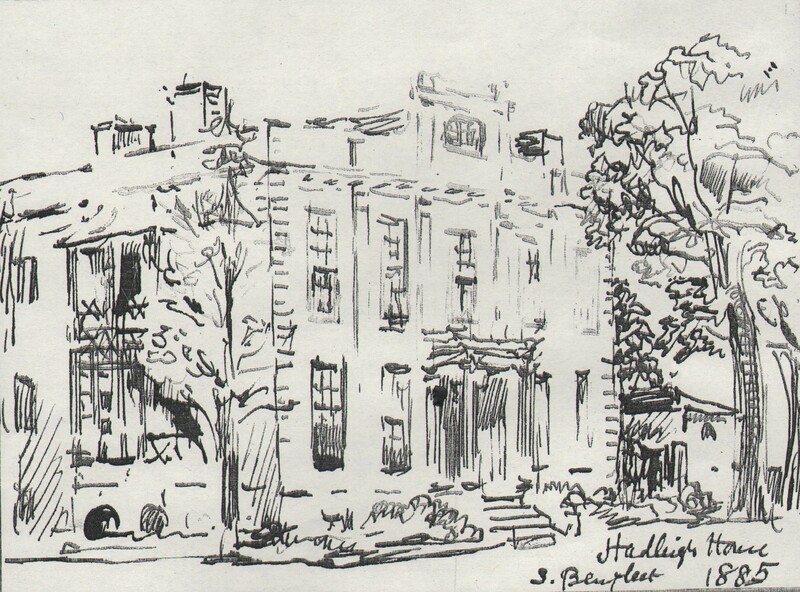 He married Sarah Elizabeth Keightley the following year and Hadleigh House remained the family home for the celebrated couple and their growing family until 1876 (Charles Archibald b.1867, Archibald Keightley b.1871 and Sydney Hugo b.1875). Incidentally, all three boys went on to achieve national eminence in their own right: Charles (2nd Baronet) became a highly respected ecclesiastical architect, Archibald became a much-feted stained glass artist (local examples of both brothers’ work at St Mary’s, South Benfleet and St Alban’s, Westcliff) and Sidney – one time organist at Westminster Abbey – was knighted for services to church music (principally for founding the Royal School of Church Music). It is extraordinary that Sir Charles (1st Baronet of Luddenham) is not better feted in Castle Point. A couple of roads (which abut the site of his old estate) are named for him, but that is all. 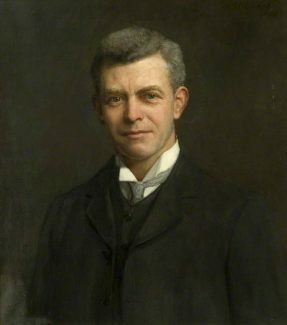 Perhaps it is because his most illustrious achievements preceded his sojourn in Hadleigh House – and his fame and fortune was made on the other side of the world. He was, without doubt, one of the great figures of 19th-century Australia: doctor, explorer, patron of the arts, educationalist and politician. 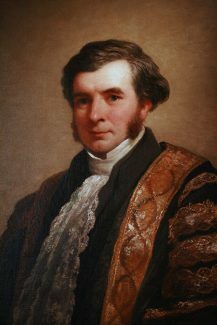 He founded the University of Sydney and became the Speaker of the New South Wales Legislative Council (for which he was knighted in 1852) before being created Australia’s first baronet in 1859. Nicholson’s roots are shrouded in mystery – he was born illegitimate in 1808 as Isaac Ascough, to a well-to-do lady in Cumberland and suffered an identity disguising name-change by the time he gained his medical degree from Edinburgh. Shortly before his twenty-fifth birthday he sailed to Botany Bay as a convict ship’s surgeon. Once there he established a medical practice (as a gynaecologist and obstetrician) and, in 1843, after inheriting his uncle William Ascough’s wealth and becoming successful in various businesses, he became a founder member of the Legislative Council of New South Wales (later, the Speaker) and Chancellor of the University of Sidney. Nicholson returned to England’s shore in 1862 as a Baronet, having been away nearly 30 years. He never returned to Australia but maintained a professional interest in it as a consultant to the British Government. He was given the honorary degrees of D.C.L. by Oxford, and LL.D. by Cambridge and Edinburgh universities. Nicholson died in England on 8 November 1903, a fortnight before his ninety-fifth birthday. 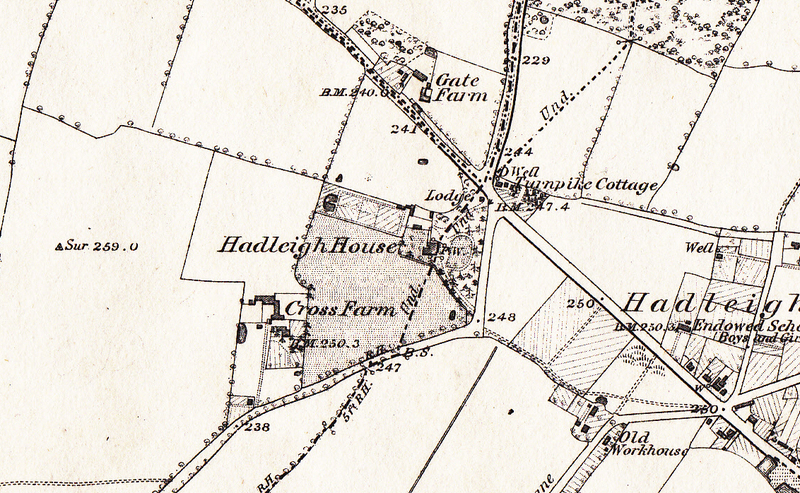 The Nicholson family left Hadleigh in 1876 and the house was let to a succession of tenants. 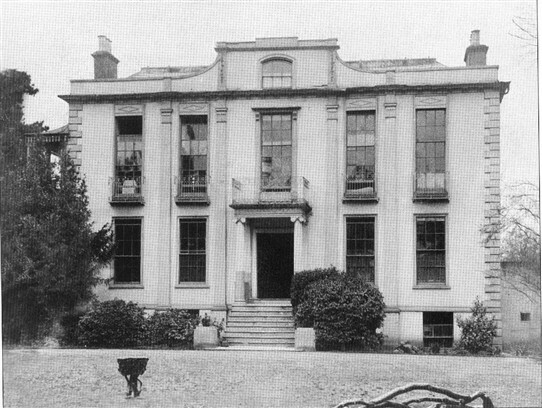 Years later, at the age of eighty, Sir Charles Archibald Nicholson (who spent a period of his life saving, restoring and living at Porters Grange, Southchurch), recalled it thus: The house was an attractive one, built of timber and plaster in the Regency period, but it was anything but convenient or even sanitary according to present day ideas; the kitchen was in the basement, all the water had to be pumped, there was no gas nor, of course, electric light; all hot water had to be boiled in kettles or a copper; toadstools grew under the floors of some of the bedrooms, and there was a cess-pool for the sink wastes under the kitchen floor. However, there was a lovely garden full of fruit trees, and I was very sad when my parents left it and went to live nearer to London. 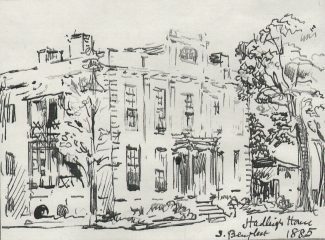 Other wealthy residents of Hadleigh House included the philanthropist Martha Lovibond, (daughter of the Chief Justice of Bengal, Sir Elijah Impey), Mrs Dunlop of Jarvis Hall, Rev Sir John Head, Thomas Brewitt, Thomas Burrells, George Asser White Welch, Henry Dillon and Captain James Trotter. 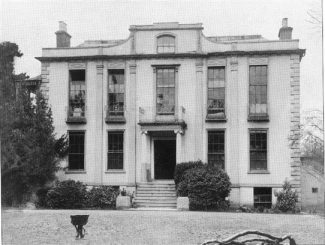 A Commercial School was housed there in the 1840s. In 1901 the Salvation Army purchased the property and, for a period of about five years, it became a place where hopeless inebriates were given a fresh opportunity to rehabilitate themselves, under William Booth’s “Darkest England” scheme. Its name was changed at this time to Victoria House (to distinguish it from the smaller Hadleigh Hall, which they also owned) and from henceforth Four Wanz Way became known as Victoria House Corner. During the next decade the house was allowed to fall into ruin and by 1923, in the aftermath of the Great War and the ensuing period of austerity, the best option appeared to be to sell the estate off as “plotland” (though some of the outbuildings remained for a number of years, including the gate lodge. 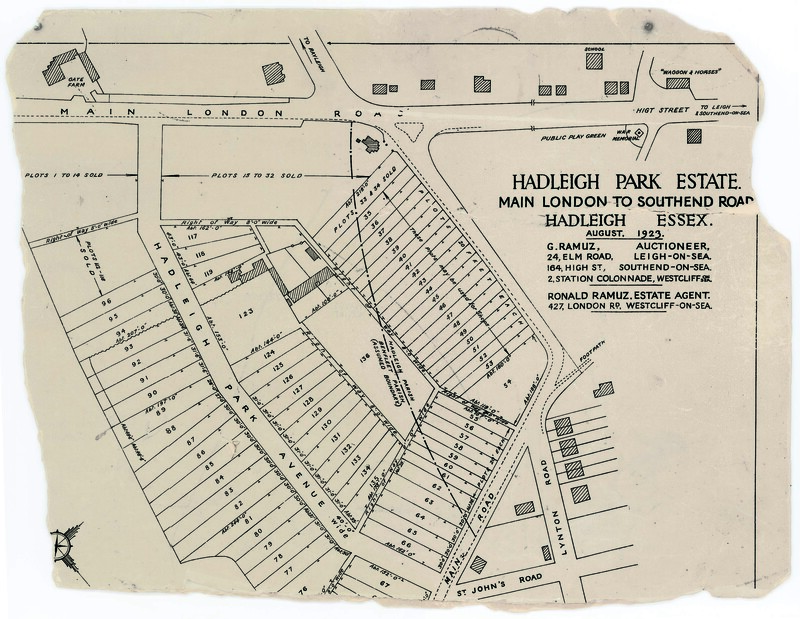 Hadleigh Park Avenue, Pinetrees and a parade of shops now occupy the site. Within about the last decade, one of the old wells was uncovered when the (then) occupant of number 19 HPA was digging the footings for a new garage, and the water still flowed (westwards) clear and sweet. 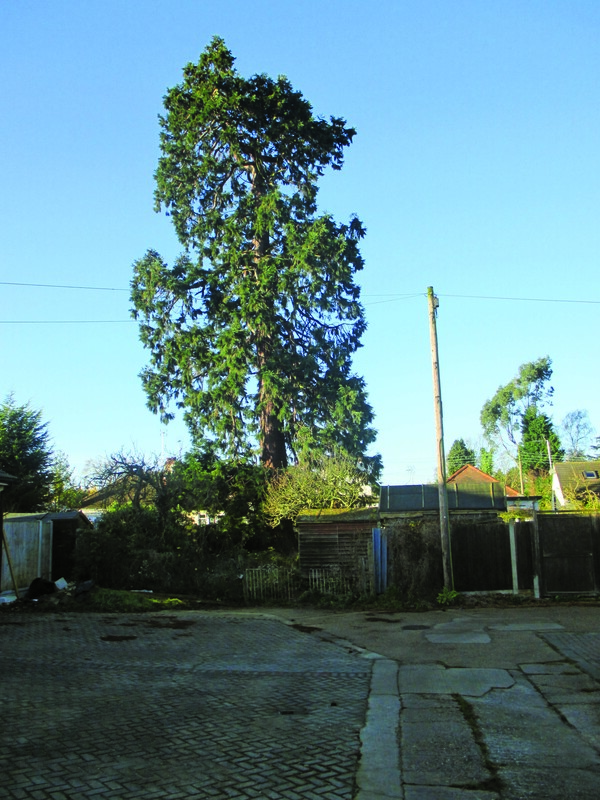 The Scots pines which gave the road Pinetrees its name were culled a few years ago by a (perhaps over-zealous) home-owner and nowadays, the only visible remains of the old Hadleigh House estate are a western boundary of sessile oaks and, of course, the fabulous, glorious Wellingtonia. The Hadleigh & Thundersley Community Archive would be delighted, should a descendant of the esteemed Nicholson family (one with a strong interest in their family history), make contact through this website. I was born in 1942 in Hadleigh on the London Road on the way to Thames Drive in the house squatted by my Grandmother. After a family fallout, my mother (my father was away fighting in Italy) rented a property in Hadleigh Park Avenue in I think 1943 and it happened to be number 25 although at that time the bungalow was called “Laxey”. We lived there for approximately 11/12 years and in the early fifties moved to Hart Road Caravan Park run by Benfleet Council. Regarding the wonderful tree, I think you will find that it was struck by lightning but not in the 1980’s but earlier than the ’40s anyway. I can remember as a child growing up that it did not have a top to it even then, in fact I remember someone saying that it was hit by a doodle-bug, but that I don’t believe for one minute. Anyway it was a fantastic tree although my father used to curse that it took all the water and goodness from the garden and also that it’s roots would probably crack the house. 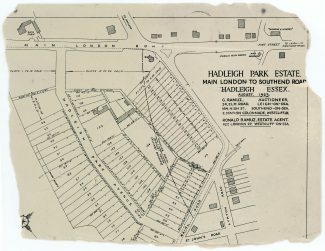 Our playground as kids was the old Hadleigh House grounds which had wonderful orchards and also a huge Mulberry tree which was duly robbed by everyone in the street at fruiting time. I used to run down the garden past the redwood and over the fence into the grounds, it was a very free and wonderful time.